After last week’s draw against Sant Andreu, Gabri Garcia’s side were looking to win and they did so with an impressive performance on Sunday. 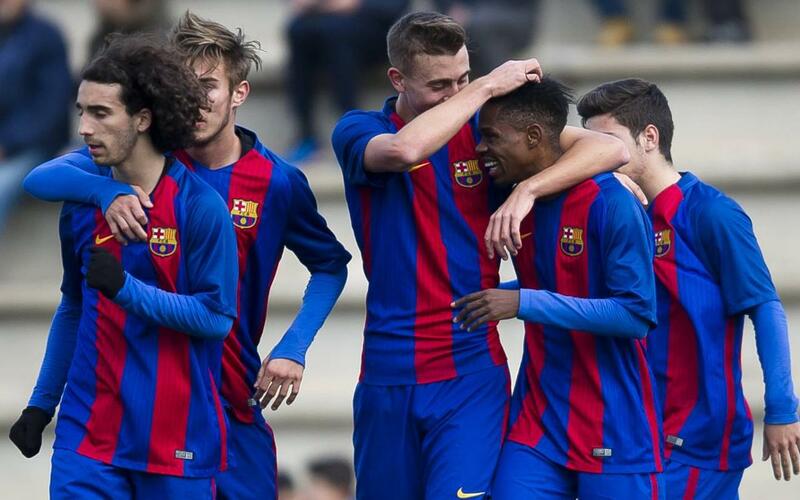 The victory helped increase the gap at the top of the table to nine points, following second-placed Español’s draw against Sant Andreu. The opening minutes of the game saw both teams playing within themselves and this continued until Barça took control and began to threaten the opposition’s goal. In the 10th minute, Carles Pérez made the most of the game’s first chance to control with his chest and bury the ball in the back of the net for his tenth goal of the season. The U19A team weren’t content with a single goal lead and they continued to push forward with Cucurella threatening from the left wing. However, Sabadell got hold of the ball and drew level following a long attacking which was well finished by Oli. Barça wobbled slightly following the unexpected equaliser but they responded by attacking in numbers. This paid off when Carles Pérez crossed for Fati, who scored with a precise header, to give Barça a 2-1 lead in the 27th minute. Gabriel Garcia’s side were in charge and they would have been further ahead had it not been for Alejandro’s heroics in goal. The opposition keeper saved on multiple occasions in the run up to half time. In the second half, Alejandro continued to frustrate Barça but their insistence paid off with David Alfonso managing to score the crucial third goal thanks to Carles Pérez’s second assist of the game. In the 75th minute, Cucurella crossed from the wing and Mboula scored with another header. A minute later, Adriá Guerrero came on for the first time this season following his comeback from injury with the game wrapped up. The blaugranas saw the rest of the match out comfortably and were able to secure a crucial victory which leaves them in a commanding position at the top of the table. The U19A’s lead Group 3 of the Division of Honour with 51 points, nine ahead of second placed Español. Next week, the blaugranas face Español at the Ciutat Esportiva Dani Jarque in the Barcelona derby. If they win, they will be 12 points ahead of their closest rival.